I am very excited to announce the release of my latest pattern: Ana Violeta. This tunisian crochet shawl is perfect to welcome the colder season and it uses beautiful yarn from Eden Cottage Yarns. You can find more information on the Ravelry page here. There are so many ways a design can come to be, and in this case it was meant as a gift to a special person. I created the first version of this shawl as a present to a wonderful woman that has been part of my life since I was born, to whom I owe much more that I could ever share in a few words. Some family you don’t choose, and some you do: even though we are not blood relatives, she has always been family to me. She taught me so many things: how to pray, how to set the table, how to make meringue, and most importantly, how to crochet. She showed me how kindness can change people’s lives, that patience is a virtue and that love, true love, can last a lifetime. Her name is Ana Violeta, and to her I dedicate this shawl. This design has made me think of the power that our projects have: how much love we put into them and how much love we can give if we present them as a gift. I don’t usually crochet for others, and therefore when I do it is extra special for me. Do you usually knit or crochet for others? Or have you ever dedicated a project to someone special that is no longer with you? Let me know in the comments. Finally, as a little treat for you I am offering a 50% discount on this pattern until the 13th November, just use the code “TREAT50” when you are checking out on Ravelry. Hope you a great day! Hello! Hope you are having a nice Sunday, I have finally finished all my house chores and have sat down for a lazy evening. As I mentioned in my last post, I was nominated on Jess’s blog for the Creative Blog Hop, it is basically four questions you need to answer about your creative process which in my case is designing crochet patterns. So here it goes! Sneak peak of my latest pattern in progress! I am currently working on a new pattern for a shawl in Ginger’s Hand Dyed Splendor 4 ply. 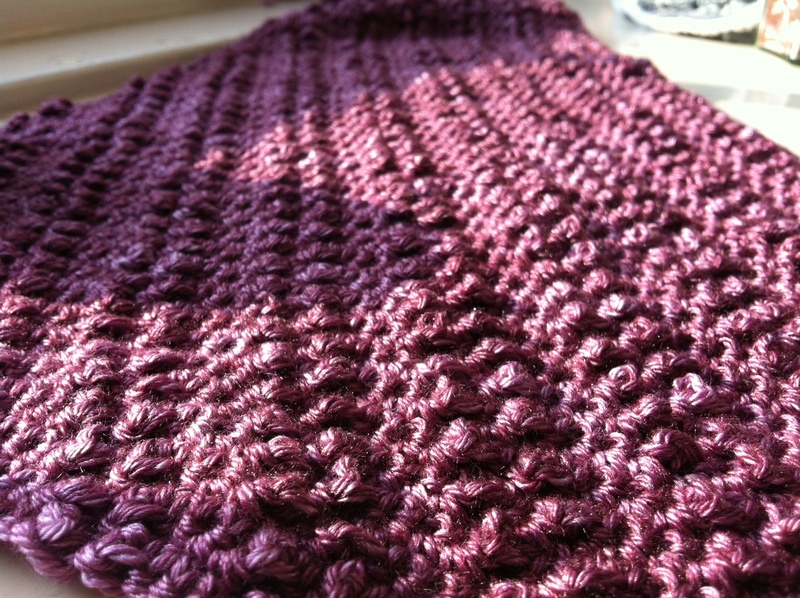 This is definitely the most luxurious yarn I have ever worked with and because the yarn is so amazing by itself I decided to make a really simple pattern with it. It has been so relaxing to crochet without counting or following a chart! I am also doing a swatch for a pair of mittens I liked in the last issue of Inside Crochet. I definitely want to get some more mittens and hats done before the (cold Scottish) winter comes. I started creating patterns as a personal challenge to be a bit more creative and less… structured, logical and well, less the engineer I am by profession. I wanted to see if I had it in me to create something from scratch, from idea to pattern to sample. It has always been really hard for me, in any aspect of life, to be creative. Well it turns out I am now an structured, logical engineer that can design patterns. We are who we are, but I have learned we can always be more and better. That is why I started designing patterns but the reason why I keep on doing it is simply because it makes me happy. I struggle most of the time, it takes forever to finish and I could definitely finish more projects if I just followed other designers patterns all the time, but that won’t make me feel the joy I feel when I share a pattern with the world and contribute to an amazing community of crafters, makers and creators. I usually start with the yarn: I have a big stash so have been wanting to get rid of some and save money (which of course hasn’t happened). After the yarn comes the research to find stitches and techniques, I go and get books from my local library and search online as well. I really enjoy this part of the process but it can take quite some time! For any pattern I will have in my head the feeling and type of project I want for that yarn (is it lacy or textured, does it go around the neck, or my hands, etc. ), so as I go through stitches something eventually clicks into place and I can see the final project. Then comes the shaping, which is supposed to be just math but I have to say years of calculus and algebra doesn’t mean you get it right the first time around! After a few attempts I have a sample, then I write down the pattern and wait for you guys to point out all my mistakes 😛 It doesn’t always start with the yarn though, for the pattern I am working on right now it started with a stitch I fell in love with and the shawl just came to my head. That was really fun to answer 🙂 This is the part where I nominate people to do this but I don’t know who! I don’t know many bloggers… does it have to be someone you know? I am not sure… Feeling really dumb right now but if you create anything (doesn’t have to be crochet), please welcome to nominate yourself by me, you can even let me know and I can make it official! Thanks for stopping by, I will post a “journey update” in the week with what I have been working on lately.